Are you tired of it taking only 15 minutes to drive from St. George, UT to Mesquite, NV? Have you often wondered how you can drive to Mesquite and take over 5 hours? Well here's your answer. I drive the dirt roads across the AZ Strip several times each year. There are much easier routes than the one I'll describe here. My route started off leaving I-15 just south of St. George at the Black Rock Road exit. 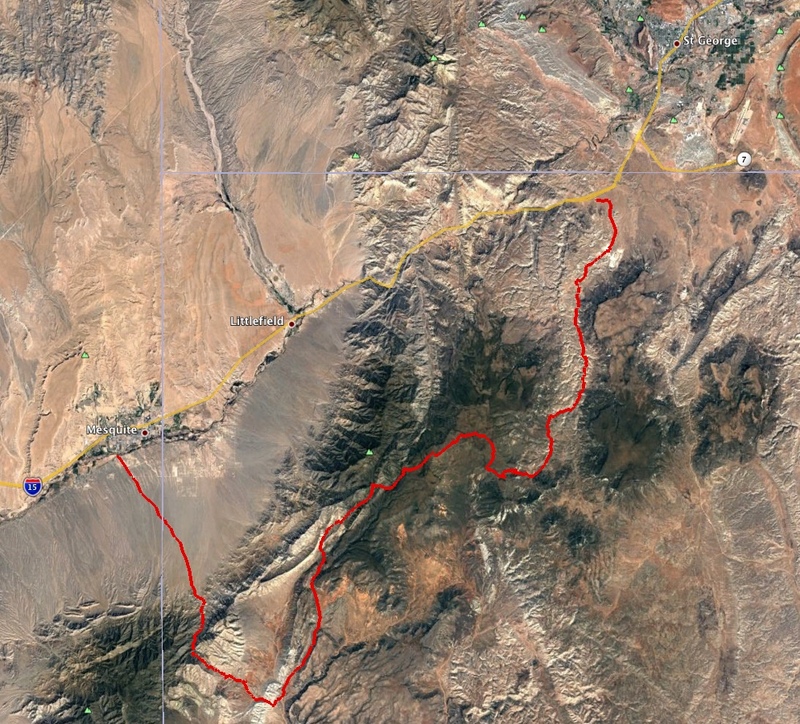 I drove south on Black Rock Road to BLM Route 1009 and continued south to Route 1004. I turned west onto 1004, drove past the top of Elbow Canyon and continued south to Route 101. Then I took Route 242 down to Mesquite. This is not even the route I was planning to drive. I was planning to take BLM Route 1022 across the higher elevations heading south toward the Black Rock Fire Lookout Tower. That would have been more difficult and taken even more time. Unfortunately, Route 1022 was still closed for the winter. Black Rock Road starts off with the standard warning sign. BLM Route 1009 picks up after you reach the big gypsum mine. I encountered 3 large trucks barreling down the road toward me from the mine. The start of 1009 is pretty easy and it took me no time to reach the turnoff for 1022. The yellow warning sign at the start of 1022 reads "Road 1022 CLOSED For Winter 13 Miles". The road surface varies on 1009. Most of it is smooth but a few sections have embedded rocks. Notice the embedded rocks in the above photo. Those force you to drive slowly. They should do that to roads near schools or other places where people should drive slowly. The next photo is even worse. It had rained in the past few days and it sprinkled a bit during my drive. I was worried that the rain might cause me to wait/camp or turn around. The roads in that area can be impassable when wet. The slimy mud quickly fills your tire tread and any attempt to accelerate, brake or turn are just hopeful propositions. It's quite scary. Luckily, the roads were in very good condition. Driving across 1004, I came upon a gathering of off roaders enjoying the cool mountain air. I had hoped to visit the Black Rock Fire Lookout Tower. Here's a google map centered on that. The entrance gate was closed and locked. And the zoomed photos I took of the tower seem to show the window shades are all secured. So I think it was still closed for the winter. Driving west on 1004 the road has more variation in surface roughness. I failed to take any photos of the most tricky steep boulder-strewn switchbacks. My attention was entirely on the road in those places. Oh yay! More embedded rocks. Here's a shot looking south across the Paiute Wilderness area. I've driven almost all these roads several times in the past. The only section that was new to me was the stretch of 1004 from the top of Elbow Canyon down to Route 101. At this point the road enters the Grand Canyon Parashant National Monument. That was also the most difficult section on this route. I actually used low range in one spot to crawl over some large bedrock formations. This was the only place along my route that I decided to get out of the truck and recon the obstacle. The rocks had plenty of scrapes and tire marks. My Land Cruiser didn't break a sweat and just drove right over with no scraping. The LC offers much eye-candy for off-roading. I mostly ignore it. Although I can see that this boulder was 45 miles from the gas station in St. George. Many quad ATV riders passed me heading north on 1004 and south on 242. Route 1041 looked much more heavily used at the northern end. But I was planning to take 1004, so I stuck with my plan. Within a few miles I was regretting that decision. Next time I'll drive 1041 and see if it's easier. I encountered cattle herds at several places along 1004 south of the 1041 turnoff. One group was really pissed. They did not want to move off the road. I sat and waited until they started moving. They stomped and snorted and made a big fuss. I suspect the ATVs came up 1041, otherwise the cattle would have already been chased off the road by them. Some views along 101, south of 1004. After reaching Route 242, I stopped off to visit Red Pockets. I've driven by many times but never visited the place. It was not what I expected and I'll describe it in a separate post. Route 242 twists around the hills with steep slopes to climb and descend. After reaching the NV state line, I looked back at the warning signs for the road I just drove. I'll return mid-summer so I can drive my originally planned route on 1022. 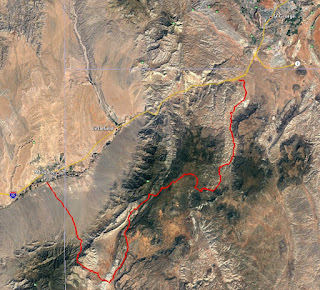 Then I can visit the cell tower over the Virgin River Gorge as well as the Black Rock Fire Lookout tower. The distance along this route isn't very great. The reason it took me over five hours was: (a) I stop a lot to take photos (I took 272 photos on this drive), and (b) the road surface is so rugged along sections of 1009 and 1004 that I was driving less than 10 mph. If you're planning to drive this route, then be sure to have 4WD and high ground clearance (10+ inches work well and eliminate the need to carefully choose your line). You probably don't need a 2-speed transfer case, but it can be helpful in spots. Bring a shovel in case you need to do some road repair after any recent rain storms. It would also help to have traction aids, maybe a winch, and maybe camping gear, in case you have to wait out any big rain storm. The roads dry fast there due to the low humidity.